More Product InfoThis is a black 3 foot male to male USB 2.0 cable with one A-type connection and one B-type. 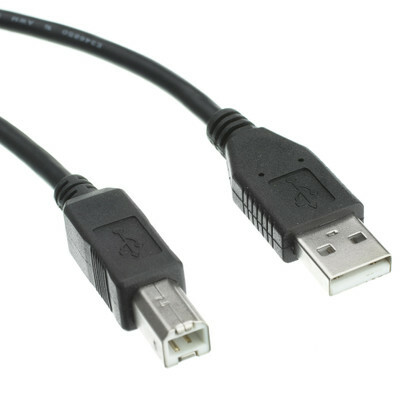 These are more commonly known as USB Printer/Scanner/ Device Cables. Type A is typically the style of connection found on the backs of PCs. Type B is the smaller square connector typically found on devices such as: printers; scanners; external hard drives and USB hubs. USB 2.0 cables are backwards compatible as they can carry a USB 1.0 and 1.1 signal. The maximum length for a single USB cable is 15 feet. To get more than 15 feet you will need to boost the signal with a repeater Cable (Parts: UC-50200, UC-50500, 11U2-51032 or 11U2-51049) or Hub (Parts: 40U2-14260, 41U2-02707, 41U2-21700 or 41U2-22100). The quality on these cables is great. We are grateful to have reliable cables to send to our customers. This USB cable is great. I bought it to connect an external hard drive to my computer (my older USB cable died). It is a very simple cable produced to do a very simple job. You can't beat the price. Worked immediately--thanks, guys. If need be, shall buy from you in future. Great product. Great price. No problems. i need 12" cables also.... same type but i need them in 12 inch length. do you have them? if you do, i need 4. Just what I needed for a USB printer in length.